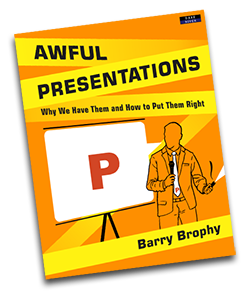 Most people’s response to an afternoon of presentations will be: ‘Do I have to stay for all of them?’ Presentations are often dull and ineffective but they don’t have to be. A presentation and a conversation are essentially the same thing and if you arrange your content properly, you can present as easily as if you were chatting to a group of friends. Conversations are interactive, listener-focused, personal, emotional, bullet-point free, funny, full of stories and littered with crunchy examples, analogies and demonstrations. They will even have visual aids if you have a phone or scrap of paper handy. Presentations can and should be the same but well-meaning presenters are thrown by unconscious biases during preparation that lead them to fill slides with text and read it out, speak in the abstract not in the concrete, talk over the listener’s heads, talk for way too long and shut the audience by not encouraging interaction. I look at why this is and how to do things right. I have been training companies in the private sector for the past 15 years. Clients include: BP (UK), Cable & Wireless, Charterhouse International (IOM), De Puy, Eirgrid, Engineers Ireland, ESB, Faber Maunsell, Jacobs Engineering, Microsoft, Minalogic (Fr), PM, Warner Chilcott (UK) and Wyeth. I have also developed two masters courses at University College Dublin focused on technical presentations – see video.